Set in the scenic Spis region, Hotel U Leva, a restored medieval family hotel, is centrally located right on Levoca’s Main Square and offering landmark views. It offers free wired internet access and free parking. All spacious rooms provide a welcome drink, a flat-screen TV, a minibar a private bathroom, and a minibar. 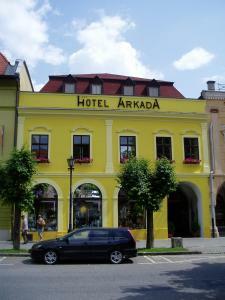 Hotel U Leva boasts views of the beautiful old town square. The close proximity of the Tatra National Parks, as well as Levoca’s ski area and the mountains, offer rich opportunities for summer and winter holidays. When would you like to stay at Hotel U Leva ? Room with a TV, a minibar and a private bathroom. Welcome drink is provided. Unit with 2 adjacent rooms, one with 1 double bed and another with 2 single beds. Facilities include a TV and a minibar, as well as a private bathroom. Some units also come with a small kitchenette. Welcome drink is provided. Unit with 2 bedrooms, one with 1 double bed and overlooking the historic square, and another with 2 single beds. It also comprises a living room with a seating area and a kitchenette, and a private bathroom. Facilities include a TV and a minibar. Welcome drink is provided. Each day we'll check prices and send you an email for your selected dates at Hotel U Leva. If you don't have specific dates but would like to check prices for say next weekend or say next month we can check the price too. Click to write a review and share your experience of Hotel U Leva with other travellers.